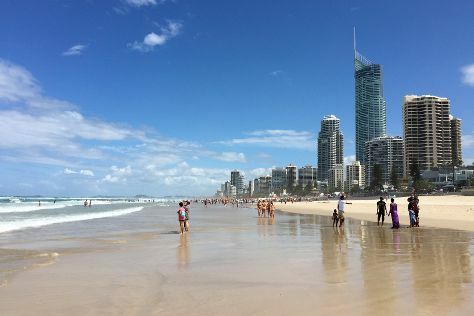 Visit Surfers Paradise Beach and Burleigh Head National Park for some beach relaxation. Get some cultural insight at Ripley's Believe It Or Not! Surfers Paradise and Watling Fine Art Galleries & Burleigh Framing. There's lots more to do: kick back and relax at Burleigh Heads Beach, get in on the family fun at Warner Bros. Movie World, stroll through Coolangatta Beach, and try out the rides at Sea World Theme Park. To see traveler tips, photos, maps, and more tourist information, use the Gold Coast trip planner . Winnipeg, Canada to Gold Coast is an approximately 23-hour combination of flight and train. Due to the time zone difference, you'll lose 16 hours traveling from Winnipeg to Gold Coast. Plan for much hotter temperatures traveling from Winnipeg in March, with highs in Gold Coast at 32°C and lows at 23°C. Finish up your sightseeing early on the 2nd (Tue) so you can travel to Manly. 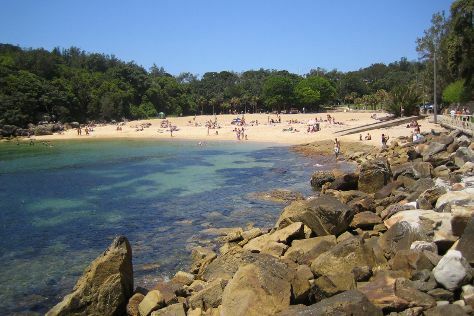 Visit Shelly Beach and Fairlight Beach for some beach relaxation. Escape the urban bustle at North Head Sanctuary and Whale Beach. Change things up with these side-trips from Manly: Barrenjoey Lighthouse (in Palm Beach) and Ingleside (The Baha'i Temple & Baha'i House of Worship). There's lots more to do: kick back and relax at Balmoral Beach, Mosman, steep yourself in history at Manly Quarantine Station, browse the exhibits of Joel Coleman Gallery, and view the masterpieces at Aboriginal Fine Art and Craft. For where to stay, more things to do, and more tourist information, go to the Manly trip itinerary maker tool . Do a combination of flight and ferry from Gold Coast to Manly in 4 hours. Alternatively, you can drive; or take a bus. Traveling from Gold Coast in April, you will find days in Manly are a bit cooler (26°C), and nights are about the same (17°C). Cap off your sightseeing on the 5th (Fri) early enough to travel to Waverley. On the 6th (Sat), visit a coastal fixture at Macquarie Lighthouse, steep yourself in history at Vaucluse House, then tour the pleasant surroundings at Nielsen Park, and finally learn about wildlife with up-close encounters at Taronga Zoo. To find reviews, photos, maps, and other tourist information, go to the Waverley online vacation planner . Traveling by car from Manly to Waverley takes an hour. Expect a daytime high around 26°C in April, and nighttime lows around 17°C. Finish your sightseeing early on the 6th (Sat) to allow enough time to travel to Parramatta. Parramatta is a suburb of Sydney, Australia, 23km west of its central business district on the banks of the Parramatta River. Othman Bin Affan Mosque and Holy Family Catholic Church are good opportunities to explore the local culture. Hillsong Church and St. John's Cemetery will appeal to history buffs. The adventure continues: identify plant and animal life at Featherdale Wildlife Park, take in the architecture and atmosphere at Our Lady of Lebanon Cathedral, examine the collection at Brislington Medical and Nursing Museum, and take an in-depth tour of Female Orphan School and Margaret Whitlam Galleries. To see more things to do, photos, traveler tips, and more tourist information, you can read our Parramatta trip maker website . Traveling by car from Waverley to Parramatta takes an hour. In April, daily temperatures in Parramatta can reach 27°C, while at night they dip to 15°C. Finish your sightseeing early on the 9th (Tue) so you can travel to St Kilda. St Kilda is an inner suburb (neighbourhood) of the metropolitan area of Melbourne, Victoria, Australia, 6 km south-east of Melbourne's Central Business District. Your inner history buff will appreciate Christ Church St Kilda and Rippon Lea Estate. Do some cultural sightseeing at Scienceworks and Williamstown Uniting Church. Get out of town with these interesting St Kilda side-trips: RAAF Museum (in Point Cook) and Werribee Open Range Zoo (in Werribee). There's much more to do: stroll through St. Kilda Beach, contemplate the long history of Bryant and may factory, take an in-depth tour of Jewish Holocaust Centre, and pause for some serene contemplation at St John's Anglican Church. To see photos, ratings, where to stay, and other tourist information, use the St Kilda day trip tool . The Route module can help you plan travel from Parramatta to St Kilda. While traveling from Parramatta, expect a bit cooler days and about the same nights in St Kilda, ranging from highs of 23°C to lows of 12°C. Finish up your sightseeing early on the 12th (Fri) so you can travel to Brisbane. Take a break from the city and head to Lone Pine Koala Sanctuary and The Brisbane River. Popular historic sites such as Catholic Old St. Stephen's Church (chapel) and Albert Street Uniting Church are in your itinerary. There's lots more to do: stroll around South Bank Parklands, take some stellar pictures from Mount Coot-tha Lookout, explore the world behind art at Gallery of Modern Art, and see the interesting displays at Queensland Museum & Sciencentre. To see more things to do, maps, photos, and tourist information, read our Brisbane day trip planning website . Traveling by flight from St Kilda to Brisbane takes 5 hours. Alternatively, you can do a combination of flight and bus; or drive. Prepare for a bit warmer weather when traveling from St Kilda in April: high temperatures in Brisbane hover around 30°C and lows are around 19°C. Finish your sightseeing early on the 16th (Tue) so you can travel back home.